This morning, I had breakfast and a good visit with my long-time friend Susan, a writer of some note. We try to do this every couple of weeks except when she’s away on a teaching tour or in Colorado helping her elderly parents navigate ill health and the challenges of their eighth decade of life. Susan and I always have a lot to talk about, mull over together, and kvetch about. She’s a poet and natural-history writer, I’m a weaver, quilter and knitter. I’m also an eclectic reader, with academic training in literary criticism and philosophy. We make a great pair. Today Susan was telling me about a series of short essays she’s been writing; they began as a consideration of the trials of getting older and experiencing her body getting cranky. (She’s facing hip replacement surgery in a couple of weeks.) She described the arc of the first essay as a movement from darkness into a kind of light and renewed wonder, enabled by her consideration of an Emily Dickinson poem. We discussed how the experience of good art (however that’s defined) can provide us with a glimpse or jolt of recognition of some truth or vision or insight that lifts our spirits and opens a fresh energy to continue moving forward. 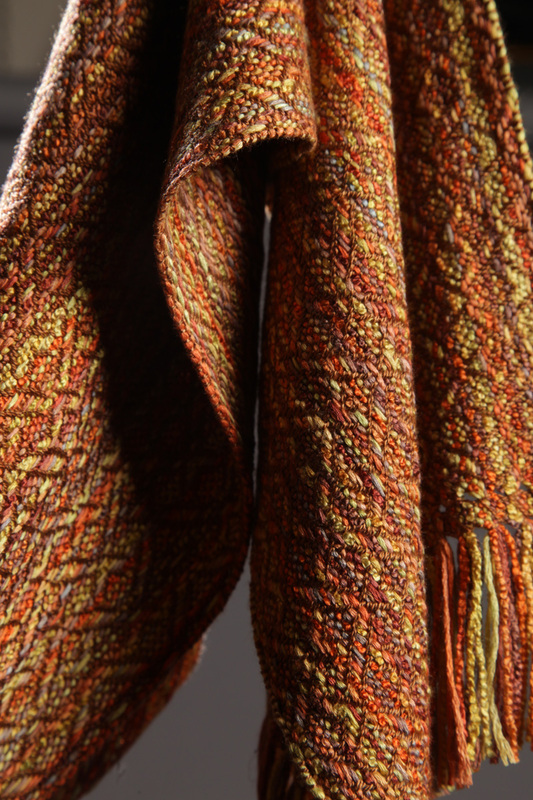 Because we have been friends for so long, and have talked so many times about her writing and my weaving, we each have a considerable understanding of the other’s work process. So when she commented that she didn’t see how these individual essays she’s writing could work as a book, how they could fit together coherently, I came up with a metaphor from my work that was helpful. Think of one of my warps, I said, long enough to weave several pieces. 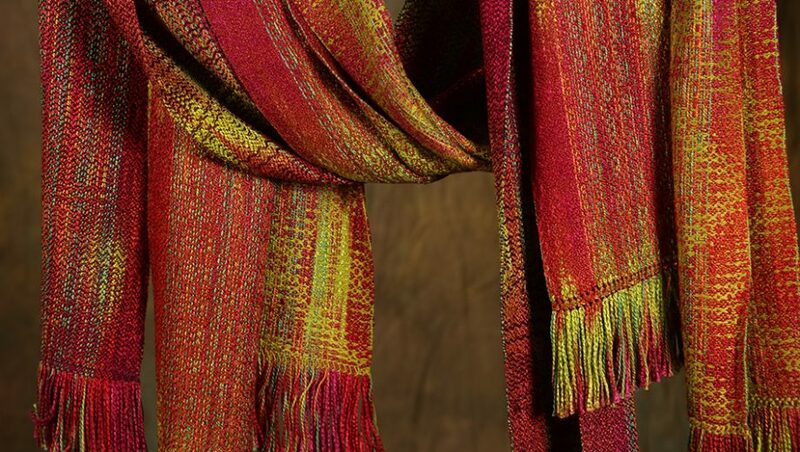 Each scarf or shawl is unique, with different patterns and different weft yarns in each. In some, the warp is easily seen; in others, it’s hardly visible. Yet it’s there in all of them, carrying through each the same theme of color and texture. Her collection of essays needs to have such a theme, or central question, or philosophical core, so that — like each item in my series of woven pieces — the common element is perceptible. Susan, who is also a visual artist of considerable ability, could visualize and extrapolate from that metaphor an approach to her essays that heretofore had escaped her. It was exciting and energizing for both of us. Reading Dreaming in Chinese by Deborah Fallows. Among other things.